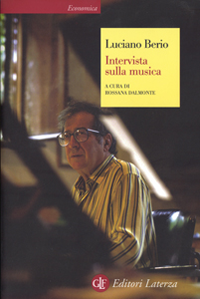 Intervista sulla musica, edited by Rossana Dalmonte (Professor of Music History at the University of Trento, Italy), is a stimulating conversation with the composer Luciano Berio, a book that traces a path through the many different themes which link the history of contemporary music. Starting from the personal experience of one of the most important protagonists of twentieth-century music, this book is a broad look at the situation of contemporary music and the composer himself. Luciano Berio is a composer known primarily for his music, which we remember the different stages of his career: for example, the serial or one conducted at the Studio di Fonologia in Milan. What emerges from reading this text, moreover, is the image of a composer who reflected deeply on the artwork and the society that, in different ways, it’s relates to music. Luciano Berio, thus, reflect critically on all the mistakes which society does with the music: for example the risks of pollution music, caused by the commercial music, spurred by the media. Analyzing the situation of contemporary music, Berio demonstrates the ability to capture the positive aspects sometimes less considered: as in the case of American music that, according to the composer, expresses its authenticity in popular music, jazz and computer music. Equally interesting is his analysis of electronic music, which emphasizes the brilliant beginning, but without concealing a situation, today, far from reassuring. Beyond the philosophical thinking, the text edited by Dalmonte is a useful moment to reconstruct some fundamental stages of the biography of Luciano Berio. From the experiences of Ogliano into the early experiences in the Milan Conservatory, then the encounter with Bruno Maderna, the experience of teaching in the United States, the meeting with Dallapiccola and even the production of traditional music, until to experience with electronic in the Studio di Fonologia in Milan. Electronic music is an important subject in the biography of Berio, not coincidentally also the Dalmonte devotes the entire sixth chapter to this theme. The analysis of this tendency by Luciano Berio, who lived as a protagonist with Bruno Maderna, is composed of several floors, as befits the issues that are still not fully resolved. On certain points Berio shows a vision that strikes the reader, pointing out a situation that is only now, after some time (remember that the interview was made in the eighties), there are obviously more clear than they were in those years. On the one hand Berio emphasizes how, electronic music, after the exciting fifties, has regressed until a state of disrepair, perhaps due to the absence of a new musical ideas that would allow bending the new sounds and the new instruments to the needs of creative thinking.